The Late Bronze Age shrines at Gegharot discussed in the recent American Journal of Archaeology article by Adam T Smith and Jeffrey Leon have made it into the mainstream scientific (and not so scientific) news. LiveScience originated the article–thanks to Owen Jarus for a thoughtful, accessible piece. The article was picked up by YahooNews, DiscoveryNews, Fox News, NBC News, and the DailyMail. The latter news outlet gave the shrines its own unique spin, proving that even the Bronze Age can be sensationalized! Ian Lindsay and Alan Greene pilot the Project ArAGATS drone. The use of remotely controlled aerial photography platforms (or more sensationally, “drones”) has received a lot of press in the last few weeks. 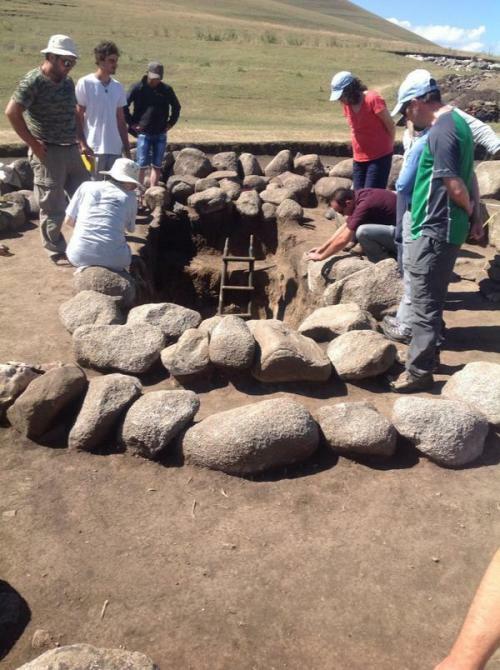 The New York Times ran a story on the use of drones in archaeology last week focused primarily on work in the Andes. This summer, Project ArAGATS deployed a DJI Phantom 2 to help document sites within our study area in central Armenia. Ancient Aragats: An Orientation from Aragats Foundation on Vimeo. The U.S. Ambassador to Armenia recently toured an archaeological field site in that country, spending time with co-directors Adam T. Smith, professor of anthropology and Lori Khatchadourian, assistant professor and Milstein Sesquicentennial Fellow in the Department of Near Eastern Studies. Project ArAGATS is a collaborative archaeological research program dedicated to the exploration of southern Caucasia’s rich past and the preservation of modern Armenia’s diverse cultural heritage. It was founded in 1998 by Smith and Ruben S. Badalyan of the Institute of Archaeology and Ethnography, Yerevan.